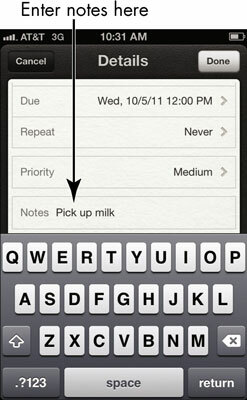 With the arrival of iOS 5 for the iPhone 4S, the Reminders app appeared. 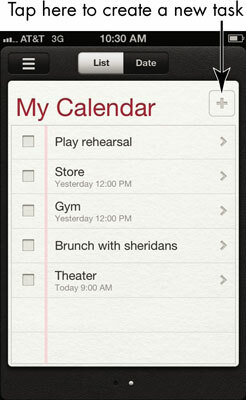 Reminders is a kind of to-do list that lets you create tasks and set reminders so you don’t forget them. You can even be reminded to do things when you arrive at or leave a location. For example, you can set a reminder so that when your iPhone detects that you’ve left the location of your golf game, an alert reminds you to go buy milk, or when you arrive at your cabin, iPhone reminds you to turn on the water . . . you get the idea. 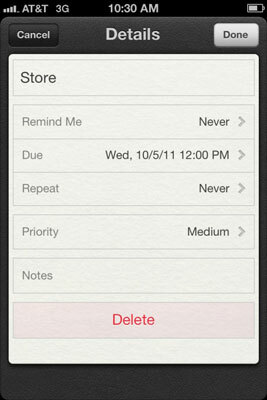 Creating a task in Reminders is pretty darn simple. Tap Reminders on the Home screen. On the screen that appears, tap the Add button to add a task. The onscreen keyboard appears. Enter a task name or description using the onscreen keyboard and tap the Return button. The new task is added to the Reminders list. You can’t add details about a task when you enter it, only a descriptive name. Tap a task to open the Details dialog. To see all the available options, tap Show More to display more choices. Tap Priority, choose None, Low, Medium, or High from the choices that appear, and then tap Done. Tap Notes and enter any notes about the event. Tap Done to save the task. With this version of the app, priority settings don’t do much: They don’t set a flag of any kind on a task in a list, nor do they reorder tasks to show priority tasks first. You can see the priority of a task only by displaying its details.